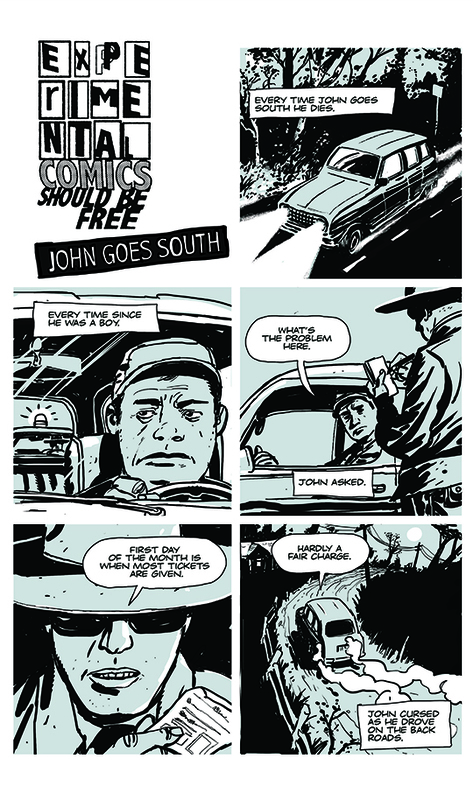 To quote Marianne Moore, “I, too, dislike it: there are things that are important beyond all this fiddle.” That’s how I feel many times about Experimental comics. But many times, experimental writing gets me out of the rut of creating and polishing “important” art and projects down to their perfect boring nubs. I have other reasons for looking into “experimenting” with sequential story telling, but for now, enough said. 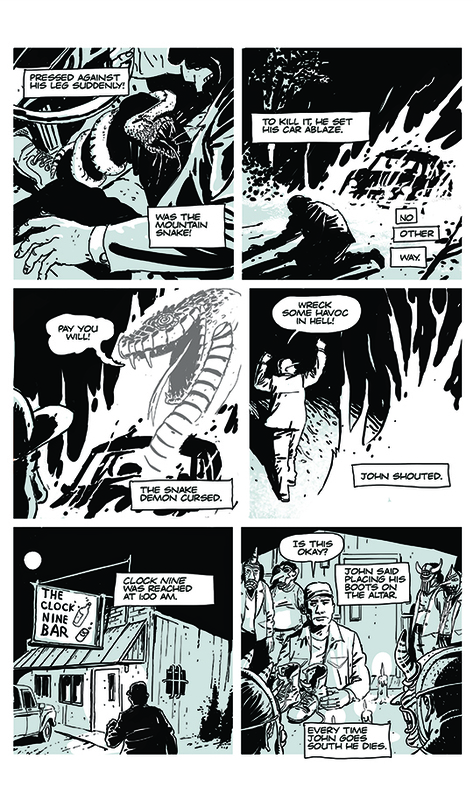 The 2 page comic below was created by taking the first few words of the first paragraph of a random story in the Times for panel one, then the second and third words in the second paragraph of that story and so on. I then finish the sentence those words started so I can have a bit of an Exquisite Corpse all by myself. I never spend more than 10 minutes writing the whole thing. With this story, I pretty much drew what I wrote (with some embellishments). I’ve already created some new “constraints for my next one so the art will be more interesting. I will bore you with those details next week. Thought I forget, eh? Day five. Three bits of art for a project you will see in 2015. I can say NO MORE! Thrilling Thursday: How To Draw Cartoons and Some Useful Information About Failure. When I’ve been paid to write, it’s usually been for something funny in Mad Magazine, Nickelodeon magazine or children’s books that slant towards the silly. I say supposed to, because one has to write a lot of stinky poop before coming up with something people laugh at. Just ask my wife. I show her all my material. So much so, that if I hand her a napkin at the dinner table she reflexively crumples it up and throws it on the floor. Way back in the mid 90’s, Back before social media when people un-friended each other in the real world with a drink to the face or the classic slap with one glove, I wrote and drew gags and strips for Nickelodeon Magazine. “Good,” Chris answered. “We don’t hire ‘those kind of people’ here.” Then he pulled a bottle of Wild Irish Rose out of his desk drawer and we celebrated. By “celebrated” I mean that Chris drank and took Polaroids while I held back tears. But he didn’t buy ALL my ideas, and with good reason. When Chris didn’t like an idea I sent to him, he’d send me a letter back with a melted chocolate bar in it. At least that’s what I told myself it was. I kept all my rejected ideas though. Grim reminders of what bad ideas are made of. Yes, kids never got to see “The Adventures of Sleepy Joe and Noisy Marg!” or “Weak Bladder Billy vs. Chuck Stunning!” or “Secret Agent Mannequin!” or “The exciting Adventures of Used Tissue Salesman!” That last one has such a gross ending, I can tell you! The point is, never give up, always explore what makes you laugh, unless what makes you laugh is Carrot Top or Gallagher, in which case you should stop exploring. Just stay home. Please. 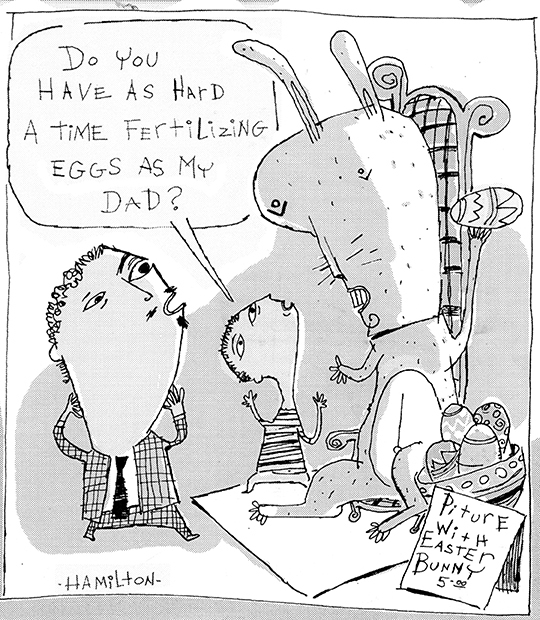 In fact, that “Easter Bunny” cartoon above is a cartoon I couldn’t sell anyplace. Nobody likes that cartoon gag but me. But I know someday someone will pay me money for that. Maybe build a whole movie around that ONE idea like a Nicolas Cage film. If my blog is to be one of those helpful blogs in a “how to draw cartoons, make money and meet celebrities” kind of way, I just wanted to point out that for all the cartoons (and few kids books) I’ve sold, I have a big folder full of rejected material and old melted chocolate bars. In fact sometimes you do some thing that NEVER sees the light of day, much like many things that go on in the Vatican. 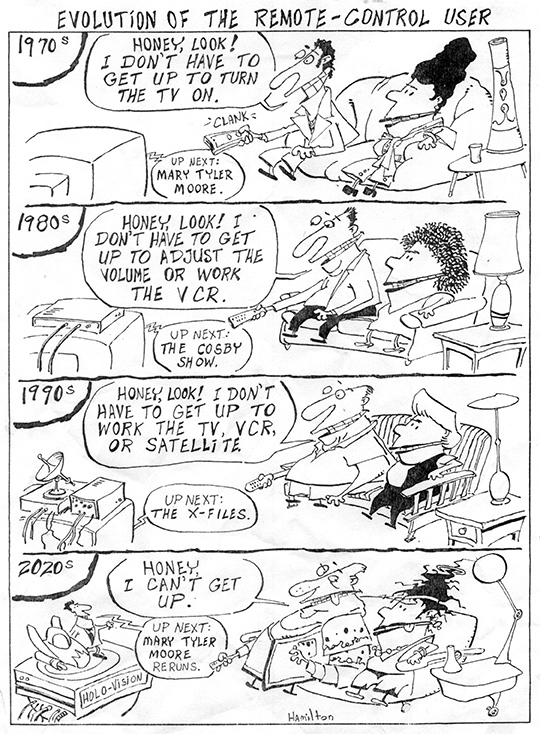 Below, you can enjoy a full page cartoon I sold to Nickelodeon way back in…the late 90’s? I don’t remember. It never did end up seeing print before Nickelodeon Magazine shut down. I thought people should see it before the year 2020 and it actually becomes sadly true and thus, not funny. 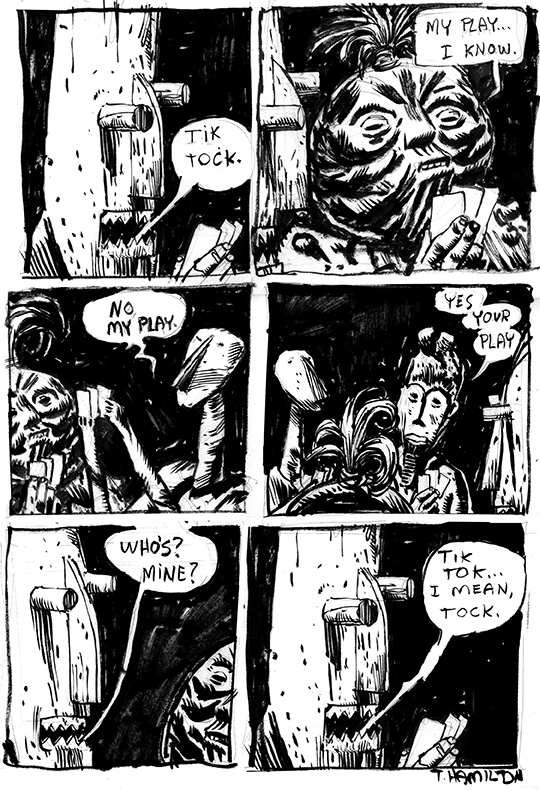 Sometimes I just like to warm up my hands by drawing a completely finished comic in ink with no pencils, no erasing, no white out. I got out my ink brush pen and drew this just the way you see it here (yes, I did take a few moments to add the grey tone in photo shop). This comic is some odd dream I had a few days ago. That is all. just came out and I did an illustration for one of those “top” companies. magazine so…you get this peek. I have to add, this magazine is a good read.